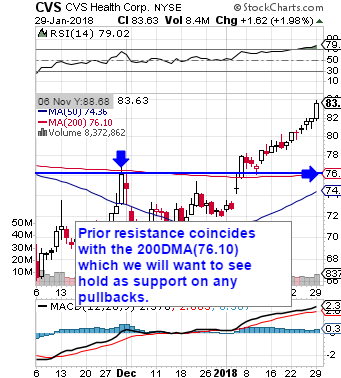 Blackberry had a strong earnings release for its 2nd Quarter on Friday, and we took that as an opportunity to signal a pair of options calls in the BB chain, namely the BB Weekly $10 & $10.50 Calls. It was a good thing that we did, because the impressive intraday move the stock made from 10.43-12.00 ended up facilitated some really nice chances for huge single-session gains. We also want to dip a toe in the water with the TSLA chain on the heels of a fast paced week of news pertaining to the SEC’s lawsuit against Elon Musk for misleading tweets back in August. Shares jumped in the premarket following word that, while ousted as chairman for a period of three years as part of a quickly-reached settlement, Musk will retain his position as CEO. In the wake of this activity this morning, we want to signal the TSLA Weekly $300-310 Calls for observation as we kick off this fresh trading week. We want to place NEOG on watch today as well for a duality of reasons. Firstly, the stock has just begun to find support after losing its shirt over the past couple of weeks, The stock is ridiculously oversold that the moment, and we caught a Form-4 filing from the CEO and other insiders buying up shares near current lows last week. 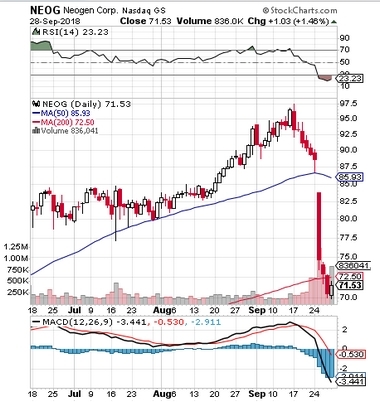 NEOG 11/16 $70-80 Calls for observation in the days and weeks ahead. First up this morning, we’re taking a look at CVS, which is currently boasting an interesting chart setup along with a recent analyst upgrade. The stock recently ran to an area of previous resistance near $84, and is currently down in the premarket along with the markets in general, but we’re going to be looking for a recovery. As you can see on the annotated chart below, there appears to be an impending Golden Cross, with the 50DMA rising toward the 200DMA, and with the company’s quarterly earnings call slated for February 8th, we’re going to signal some options that could see some nice activity. We’re going to radar the CVS 02/09 $77-80 Calls which will expire at the end of next week, and could explode with a favorable quarterly report. We couldn’t have timed yesterday morning’s call of BLDP any better, outlining the reasons we thought the stock was ripe for a reversal. Among other things, it had strung together ten consecutive sessions of decreases or sideways trading, and yesterday brought the beginning of the rebound that we suspected was due. From an early low of 3.39, BLDP made a modest, yet convincing move of 19% to a high of 4.04, before closing very near to the high of day at 4.02. It’s a good start, and we’ll want to see the stock continue to record higher highs and higher lows, and show some signs of sustaining its momentum. On Friday morning, we saw serious potential in the INTC options chain following the company’s earning beat. They posted solid figures, but some were concerned over the possible security flaws prsent in the company’s new chips. Those fears were shrugged off with ease, as the stock took off for what ultimately turned out to be an exceptionally bullish session. The move INTC made allowed for the chance at some really nice intraday profits in each of the three contracts we designated in Friday morning’s report, the INTC Weekly $47.50-48.50 Calls. We’re always looking for a good bottom play, and one may be getting ready to present itself in the near future on BLDP. We want to place the stock on intensive bottom-watch in coming sessions, after it appears that BLDP has been the target of manipulative short-seller tactics, including a very likely erroneous class action ‘investigation’ and suit by multiple law firms. We see this type of thing all the time, and very seldom does anything come of such a situation. We’ll be sure to monitor BLDP for a bottom bounce which should be forthcoming at any time, and the subsequent rebound to follow, which could bring us a shot at considerable gains from current levels. Side Note: We also want to radar Plug Power, Inc. PLUG, as it tends to trade very similarly to BLDP. We’ve traditionally looked at these plays in tandem, so we’ll keep watch over PLUG as well as it comes down to find its own bottom. We’re going to start things off today by providing an update on our coverage of a really nice move in LINU subsequent to our most recent alert on the stock from the morning of September 11th. We observed a low of 1.05, and after a huge run on Friday, LINU reached as high as 3.20. It represents a very nice 205% move for us in under a month’s time. Volume over the saem period has been extremely elevated, and Friday’s session logged the highest single day volume in the history of the stock. We reported this in Friday’s newsletter, mentioning that further opportunities could be on the horizon and we did see some good action for that session as well. The $210′s traded in a daily range from 1.85-2.85 (+54%), the $215′s went from .65-1.05 (+62%), and the $220′s made a push from .25-.38 (+52%). We initially tagged NIHD in our premarket report from last Thursday, and on that day we would observe a low of .5472 in the stock. It’s been stepping its way up, but this morning in premarket trading things have really kicked into high gear, with NIHD cracking through the dollar barrier. As of this morning’s premarket high of 1.14, we’ve now witnessed an increase of 108% in NIHD over a span of just three trading sessions. In order for us to remain highly interested in this play, we’ll want to see it maintain support at or above its current 50DMA of .83 on any pullbacks that may occur. The stock was number four on the NASDAQ’s top gainer list for the day, and while it did end up tapering back to close near its daily lows, this morning it is gapping up again in the premarket. This surge of activity is primarily due to yesterday’s announcement of positive results in its ovarian cancer treatment trials. We’ll definitely be keeping CLSN on our radars and watching for the continued establishment of higher lows off of our recently observed bottom. BTSC was a part of the bitcoin watchlist we issued on May 25th in the midst of a bitcoin frenzy where the crypto-currency was soaring to new all-time highs. The residual effect for plays like BTSC has been impressive, with with stocks PPS making a jump from our observed low of .0366 up to a new high of .164 yesterday, which represents a 348% rip which occurred over a period of just seven sessions. Not only is EGLT coming off of a bottom on the chart, but in the space of the past 36 hours, the company has made two major announcements.